Fiction or Fact? Fighting between Irish and Chinese Transcontinental Railroad Workers. REALLY TRY TO BLOW EACH OTHER UP? "The Central Pacific had made wonderful progress coming east, and we abandoned the work from Promontory to Humboldt Wells, bending all our efforts to meet them at Promontory. Between Ogden and Promontory each company graded a line, running side by side, and in some places one line was right above the other. The laborers upon the Central Pacific were Chinamen, while ours were Irishmen, and there was much ill feeling between them. Our Irishman were in the habit of firing their blasts in the cuts without giving warning to the Chinamen on the Central Pacific working right above them. From this cause several Chinamen were severely hurt. Complaint was made to me by the Central Pacific people, and I endeavored to have the contractors bring all hostilities to a close, but for some reason or other, they failed to do so. One day the Chinamen, appreciating the situation, put in what is called a "grave" on their work, and when the Irishmen right under them were all at work let go their blast and buried several of our men. This brought about a truce at once. From that time the Irish laborers showed due respect for the Chinamen, and there was no further trouble." Here are some comments by historians who point out that Grenville M. Dodge was in Washington, D.C., not Utah at the time. They believe this is a made up story about the Irish and Chinese trying to blow each other up that not only never happened, but that there isn't even any such place where CPRR Chinese and UPRR Irish workers ever worked side by side. 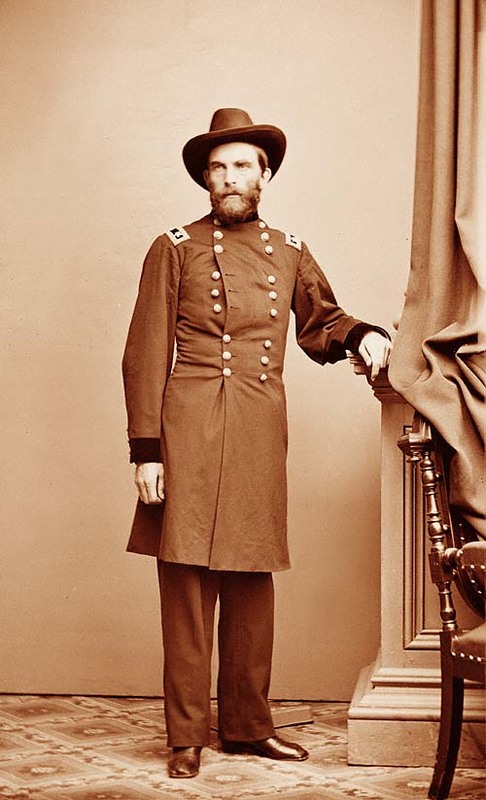 "Whatever his auxiliary duties, Dodge had no direct connection with the physical construction of the Union Pacific. He had no authority over the graders, tie-cutters, bridge builders or John Casement's track layers. He did not even have charge of the Engineers assigned to the construction forces, the men who staked out the work and held the contractors to proper technical standards. As he himself [Grenville Dodge] explained privately: 'My duties commenced and ended with the development of the Country and the determining of the Line across the Continent. I disbursed no Contractors funds and I had no control, directly or indirectly, over Contracts or Contractors.' "
"Grenville Dodge and the Union Pacific: A Study of Historical Legends." Wallace D. Farnum. Journal of American History, Vol. LI, No. 4, March, 1965, pp. 632-650. Regarding Chinese and Irish blowing each other up, I found no supportive evidence in any CP report, wire, or correspondence (including all of the personal correspondence of the Crockers, Stanford, and Hopkins) and nothing in any contemporary UP report or correspondence (Reed, Blickensderfer, Durant, Dodge, or Dillon), and nothing in local newspapers or wired reports. Dodge's "How We Built" was published 40 years after the Golden Spike, and his memoir is highly selective of facts; Dodge has to be approached with caution. ... I strongly doubt that there was any "warfare" beyond rival gangs pulling up rival survey stakes (as noted by Edwin Bryant Crocker). I heartily doubt that there were any Chinese east of Promontory. Nearly all the parallel grading work from the mouth of Weber to Promontory was done by Mormon contractors, excepting the approaches into the Promontory Mountains, where Seymour had the rock crews going in all directions at once, countermanding Dodge's original line. During some of this time (early 1869), by the way, Dodge was mostly in Washington, D.C. Between Ogden and the Promontory Mountains approach the grading crisscrossed, and not all of it was embanked—this in the Huntington letters collection. It is hard to tell with a modern eye what was done where north of Ogden. The UP did not grade west of Monument Point except that in September of 1868 they moved six teams with scrapers and enough (Irish)men to man them and graded a few sporadic locations east of Wells, then pulled them back. The UP never did hire any Mormon contractors to grade any further west than Monument Point, 16 miles west of Promontory. They did stop their grading at Monument Point but never abandoned the grade. They sold it to the CP for half what it cost them sometime after May 10, 1869. The Central Pacific abandoned the old parallel UP grade. They never used it. ... if ... the source for the quote ... is in Dodge, then his biographer may have been the one to use it to develop his story. I am convinced it is one of those made up events that authors can't let go of because of the excitement it adds to the story. ... The Chinese did not grade beyond Promontory, actually they did not grade east of Toano in the Pequop Mountains of Nevada. The Mormons graded 100 miles from Monument Point to about Toano. All the parallel grading was done by the Mormons, by both the UP and CP. I can not imagine where the two forces could have come in contact with each other. Even on the day of the Last Spike ceremony, Strobridge only brought a few of his Chinese workmen with him and by 4:30 in the afternoon they were gone. Strobridge kept his crews at Rozel to keep them away from the UP workmen. Dodge's Book was not published until 1911 so his first hand accounts are 40 years old. ... He is describing the conflicts between the two labor forces he was in Washington and would have had no first hand knowledge of the events in Utah other than what he was told or what he reconstructed some 40 years later. It is always suspect when there is only one source of information. He may be correct but with no corroboration from anyone at the scene it is certainly suspect and worthy of more examination. ... There was a lot of violence in the CP and the UP Construction camps and was amply reported in the newspapers of the day but none between the camps. The area was crawling with newsmen and surely someone would have reported a clash. This may have been a source for some overzealous reporting of the Irish and the Chinese violence. So far as I am concerned, it didn't happen, there is no proof and I believe Dodge is not correct here. So far as the parallel grading issue is concerned it is a matter of record as to what contracts were issued by which Company to who and for how far. The CP Huntington Papers are a good source of personal correspondence between the principles written at the time of the events. There are many letters between Stanford and his associates regarding the Mormon contracts, where they started and where they ended. It is documented in those letters and probably in the Chief Engineers reports that the last contract entered into between Stanford and the Mormon contractors started at Monument Point and extended west, not to exceed 100 miles. There are other first hand accounts as to when Strobridge reported reaching the Mormon Grade in Nevada (as near as I can determine at about Toano.) The Union Pacific's contract with the Mormon's ended at Monument Point and there was no other parallel grading west from that point. I have personally been over the right of way where the CP-UP parallel grade can still be seen and except for the few miles of sporadic grading east of Wells, Nevada by the half dozen or so Irish crews in September 1868 it ends at Monument Point, sixteen miles west of Promontory. Traveling east from there Stanford had again contracted with the Mormon's for the grading between Monument Point and Ogden. That grade was built only to Blue Creek when Stanford canceled his contract (I think about 14 miles east of Promontory) three days after the April 10th agreement between Huntington and Dodge as to the meeting point at Promontory and the agreement of the UP to sell their grade between Promontory and to point about 4 1/2 miles west from Ogden. There was no point in the CP grading any further. Huntington had already collected the Bonds for that section from the Government anyway. All this is documented in the personal correspondence in the CP Huntington collection and probably in the Chief Engineers report. ... The Contract and Finance Company had the contract from the California border to the meeting point with the UP. They had in their contract the complete control of the construction engineering. Their Chief Engineer was Charles Cadwallader and Joseph Graham was the Assistant Chief Engineer. Neither Montague or Lewis Clement had any responsibilities for their construction engineering after the California border was reached. Montague as Chief Engineer for the CP had the responsibility to see that the quality, quantities etc. were acceptable and to see that the right of way center line was staked but beyond that both he and Clement were working directly for the Central Pacific and were the ones involved in the Mormon contracts answering directly to Stanford. Clement probably more than Montague. They had nothing to do with the Contract and Finance Company or Strobridge beyond that. "Strobridge moved his camps back from the end of track at the waterless Promontory, to Victory, and away from the gambling tables, the bars, the guns, the fists that were prevalent in the new town of Promontory to serve the idle railroad workers." The Union Pacific did the same thing, "and moved their crews back to "Blue Creek Station" and discharged them as fast as possible to lessen the payroll." ... last summer  David Bain and I followed the CPRR from Promontory to Sacramento, using the OLD GRADE from Promontory to Wells. There is still some parallel grading evident at the Moor Offramp at I-80, but it stops there. ... The UP line, between Moor and Promontory, shows no evidence of trackage--no spikes, fishplates, rail, nothing. As one walks the CPRR line in the same area, the land is littered with relics, some of which (links, pins, journal covers, spike hammer heads,) are stamped CPRR. ... Moor is a few miles EAST of Wells, Nevada, the double grading is evident for perhaps a few miles, or perhaps less.